Home » Food and Nutrition » Supplements » Fish Oil Supplements: Do They Really Work? The nutrition industry has really jumped on the bandwagon regarding the use of fish oil to improve human health. Ever since research showed that the increased intake of fish could reduce the risk of developing several different diseases, including heart disease, stroke, and diabetes, the interest in using fish oil with concentrated omega-3 fats as a supplement has risen. So what’s the deal regarding fish oil capsules? Are they effective at improving health outcomes? Do they do the same thing as eating fish? Well, in theory, fish oil supplements containing the omega-3 fats DHA and EPA in a concentrated form should really be able to accomplish the same things from a physiological perspective as eating the whole fish. 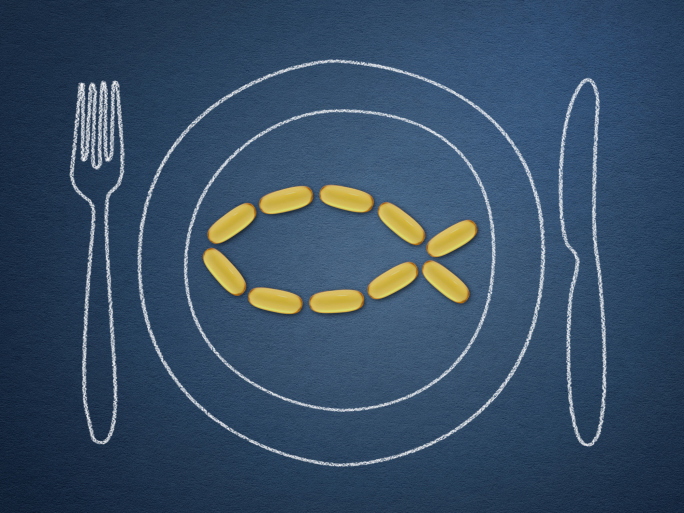 There is no doubt that eating fish has an important role in human health. However, the advantage of taking a concentrated supplement of omega-3 fats cannot be discounted. Previous reports have indicated that fish oil supplements can reduce triglycerides and LDL (“bad”) cholesterol. They can also improve blood sugar and reduce the production of pro-inflammatory chemicals that can damage arteries. Fish oil supplements can also decrease the production of blood clots and can make the blood less sticky, which can be a good thing if you want to reduce your risk of developing atherosclerosis. Although having thinner blood can help you reduce your risk of blood clots and atherosclerosis, if your blood is too thin, the risk of excessive bleeding can be an issue. Taking the appropriate dosage is important to avoid this problem. Studies assessing people who are at risk of developing Alzheimer’s or display early signs of mild cognitive impairment or dementia have shown that they can greatly benefit from the use of fish oil supplements. However, fish oil supplements do not seem to improve cognition in healthy folks. But how could they? In fact, eating more fish and consuming more olive oil has been shown to reduce the risk of ever suffering from dementia. The benefit of using fish oil supplements is in secondary prevention, because this is not only where the need is, but it is also the only place that an improvement is meaningful or quantifiable. Fish oil capsules have been used for a number of years to treat rheumatoid arthritis, an autoimmune disease, with excellent results. Unfortunately, the same cannot be said for multiple sclerosis as the results have been mixed. However, fish oil primarily exerts its affects by acting as a potent anti-inflammatory and not by directly influencing immune cells. What about the benefits of fish oil supplements and the development of stroke or diabetes? Well, the research here has also indicated that the use of fish oil to improve blood levels of omega-3 fats is associated with a reduced risk of developing type 2 diabetes and stroke. According to a recent systematic review and meta-analysis of a number of studies, the use of fish oil was associated with a greater loss of weight, body fat, and waist circumference compared to control groups who did not take fish oil supplements. Another similar analysis found that those subjects who took fish oil had better control of their blood sugar and enhanced insulin sensitivity. This finding could decrease the risk of developing diabetes. It seems that taking fish oil may not be such a bad idea, particularly if you don’t like fish or don’t regularly consume it. Bender, N., et al., “Fish or n3-PUFA intake and body composition: a systematic review and meta-analysis,” Obes Rev. May 29, 2014: doi: 10.1111/obr.12189. Brownstein, J., “Fish Oil Supplements: Sound Science or Mostly Hype?” LiveScience web site, July 2, 2014; http://www.livescience.com/46635-fish-oil-supplements-science-hype.html. Wu, J.H., et al., “Effect of fish oil on circulating adiponectin: a systematic review and meta-analysis of randomized controlled trials,” J Clin Endocrinol Metab. June 2013; 98(6): 2451–9.